Sam Bradford hasn’t exactly lit the world on fire since he entered the NFL as the number one overall draft choice in 2010. His 79.3 career passer rating suggests he has been an average at best starter thus far. The Rams subpar records under his watch lend more credence to that assessment. Bradford began the 2013 season on pace to record career best statistics across the board. Still, media members and fans alike were unsatisfied. The calls for Bradford’s head began to grow, especially after a poor showing against the 49ers in Thursday Night Football’s national spotlight. Unfortunately, Sam Bradford never really got the chance to prove his doubters wrong over the course of the season. The fourth year quarterback was lost for the year with an ACL tear suffered during the seventh week of the NFL season. The chorus of doubt was actually given a new sheet of music to read from in the weeks following Bradford’s departure. As the season progressed, the Rams offense seemed to actually improve without their franchise quarterback in the fold. 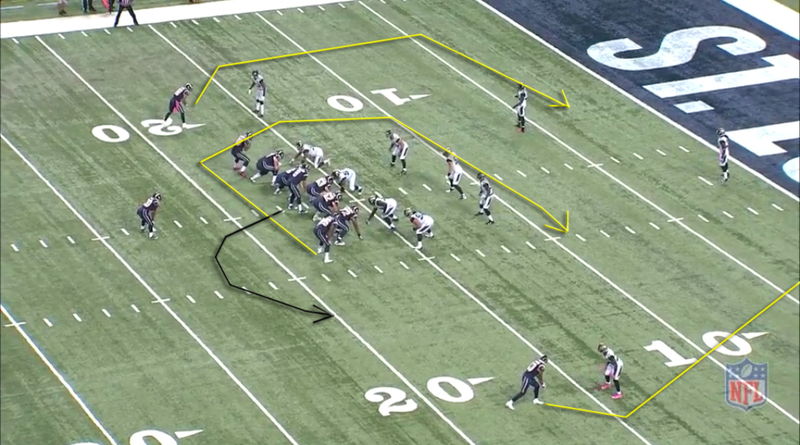 The team hit on more big plays with Kellen Clemens behind center in place of Bradford. The Rams procuring upset wins over the Saints and Colts during this time only served to throw fuel on the fire. By the end of the 2013 season, it seemed the Rams had an obvious answer to what to do with Sam Bradford. Many have decided it is time for the Rams to move on from their former top draft pick. It has been suggested they should get themselves out from under the albatross of a contract Bradford carries and use the second overall pick on one of this draft’s talented quarterbacks. The thought is Bradford has shown he isn’t good enough, and the Rams were gifted a chance to pick this high by the Washington Redskins; might as well take advantage. Not too long ago, I was amongst those who felt that was the wisest course of action. However, after taking an in-depth look at all of Bradford’s snaps during his injury shortened 2013 campaign, my feelings have changed. The view from the eye in the sky shows a passer who flashed a ton of growth, all while still playing on a bad offense. Sam Bradford’s completion percentage this season was 60.7%, and his yards per attempt figure came in at 6.44. Both of those numbers fall just at, or below, the average standards desired from NFL quarterbacks. Nothing about Bradford’s statistics scream “former number one overall pick” or “franchise quarterback”. However, as always, the basic statistics do not paint the whole picture. By charting each of Bradford’s 2013 games you can see which areas of the field he excelled in throwing to, and how efficient he was. Completion percentage does not take into account passes that were obviously thrown away, or mistakes by other teammates. To counteract that, these charts track the percentage of good and accurate throws Bradford made, and where he made them. Bradford enjoyed a generally solid day against the Cardinals. He misfired on a some screen passes that led to a few missed opportunities, but that is the only figure that jumps off the chart. You will notice a vast majority of Bradford’s passes went to the short area (0-10 yards from scrimmage) of the field, a trend that is very prevalent during the beginning of the season. The high amount of short passes is even more eye-popping here. Sam Bradford threw a whopping 75% of his passes between the line of scrimmage and ten yards away. His good throw percentage in the short area and behind the line of scrimmage are a bit lower than what you want, at 75% and 71% respectively. However, that can be explained by the inordinate amount of quick pressure let up by the Rams’ offensive line in this game. While he generally responds well to pressure, Bradford struggled a bit with bodies getting to him so fast after the snap. Week three was another outing dominated by the short passing game, as 73% of his throws were of that variety. The game against the Cowboys saw Bradford being asked to overcome a number of obstacles. The Rams’ quarterback was constantly under siege and asked to fit balls into tight windows. His receivers were seldom getting open with any regularity; this was before the Monte Kiffin defensive collapse. Despite all of those issues, Bradford still came through with good throw percentages pretty much on par with what you want from your quarterback. As previously mentioned, this was the game that began the masses’ gradual turning away from Sam Bradford. The Rams and their quarterback struggled on NFL Network for most of the country to see. St. Louis fell into a hole early, and was thoroughly outclassed by the 49ers in a 35-11 defeat. The offense put itself in a position to force things after their early rut. Sam Bradford was going against a great defense, and his supporting cast struggled mightily, but this was certainly his worst game of 2013. His good throw percentage of 65% in the short area and 45% in the intermediate area fall well below acceptable quarterback standards. Such poor throws this deep into his NFL career really stuck with viewers when evaluating Bradford’s progression. However, he bounced back after that week with three good games. It should be noted who the game was against, but Sam Bradford was very efficient when he faced the Jaguars. His work in the intermediate area of the field was particularly impressive. Bradford displayed a lot of his natural arm talent as he delivered a number of ropes to that sector of the field. His 100% good throw percentage to the intermediate left is very good, especially as a right-handed quarterback. Doubters will want to poke holes by citing “level of competition”. However, a little qualitative analysis shows Bradford isn’t just taking advantage of a bad defense—more on that to come. When analyzing this game, the “level of competition” critique is fair. With Matt Schuab and T.J. Yates throwing the game away, Sam Bradford only attempted sixteen passes. His good throw percentages are all strong and he did not do anything to hurt the team. In his final outing of the 2013 season, Sam Bradford put on his best show. Against the swarming and dominant Panthers defense, Bradford enjoyed his most efficient game. The dink and dunk strategy failed to find him any rhythm after an odd early turnover, but Bradford overcame it. The Rams allowed their quarterback to attack the Panthers in both the intermediate and deep portions of the field, and he rewarded them with a 100% and 80% good throw percentage, respectively. A few things stand out when examining the chart for the season’s entirety. As you’ll notice, Sam Bradford’s good throw percentages—in all areas of the field—are better than his traditional completion percentage. When you separate his performance from those around him, you see that Bradford was an efficient quarterback this season. The chart shows a balanced passer who is good, or better, in all sections of the field. The chart also shows that most of Bradford’s work was done in the short area of the field. 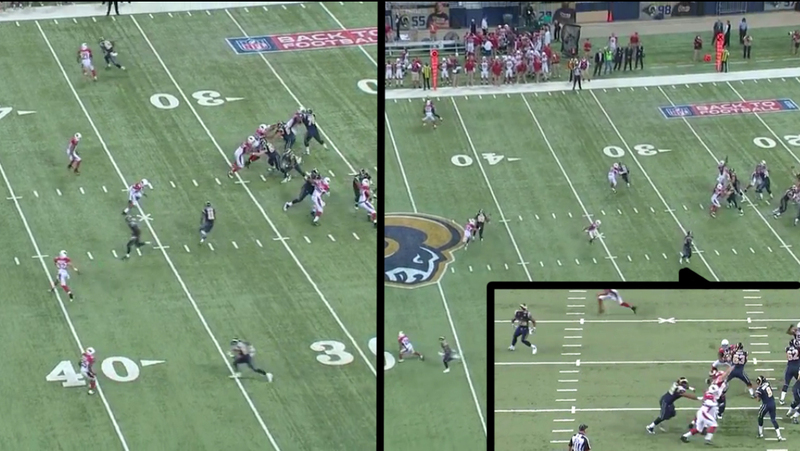 A little further analysis will show why that was not a positive for the Rams, or their quarterback. The Panthers game was the first time Brian Schottenheimer healthily mixed in the intermediate and deep passing game for Bradford. Perhaps it was a positive sign of things to come; we were not permitted to find out, as it was his last game of the season. Schottenheimer would be wise to use that game as a template to improve the very poor offensive design he implemented during Bradford’s time under center. Last season was supposed to be the first year the Rams could properly evaluate Sam Bradford. He had been forced to work with a substandard supporting cast throughout his career, but that was supposed to change this time. Brian Schottenheimer was supposed provided stability in his second season as the offensive coordinator. He was also allegedly going to open things up; spread offense style similar to what Bradford ran in college. Also, the Rams front office spent last offseason acquiring players like Tavon Austin and Jared Cook, while also counting on development from second year players like Chris Givens, Brian Quick, and Daryl Richardson. Nothing went as St. Louis had it planed. 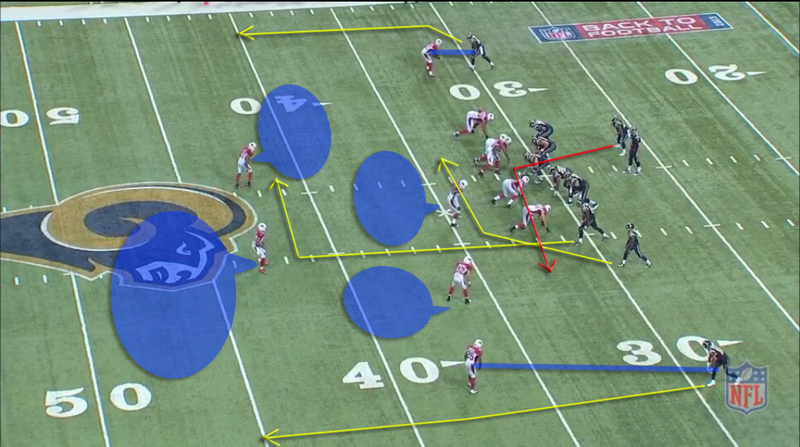 Schottenheimer failed in his efforts to reimagine the Rams as a high-flying offensive team. His game planning was poor, and he too often tried to fit square pegs into round holes. However, his most egregious error was the passing concepts he employed when his franchise quarterback was under center. On so many occasions, Brian Schottenheimer failed to design plays that took advantage of the entire field. If a team is going to build around the short passing game, they should employ slants and crosses that will gain yards after the catch. Plays like the ones the Rams employed, like in the above GIF, fail to do that. The receiver makes the catch, only to be tackled immediately by multiple defenders. 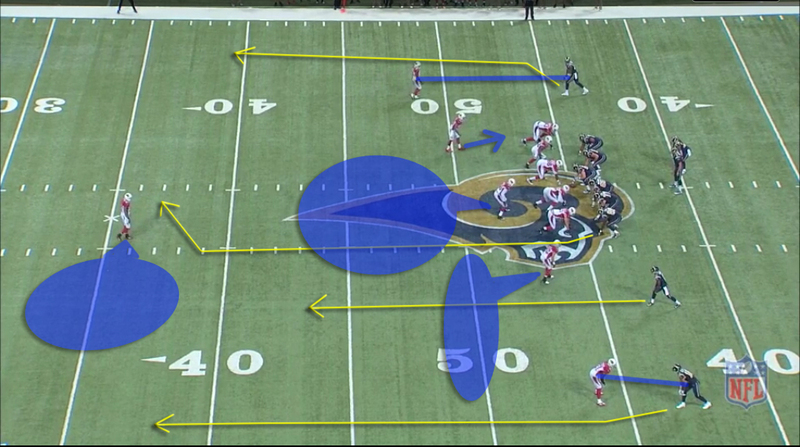 You see this type of play over and over when watching the Rams’ first seven games. 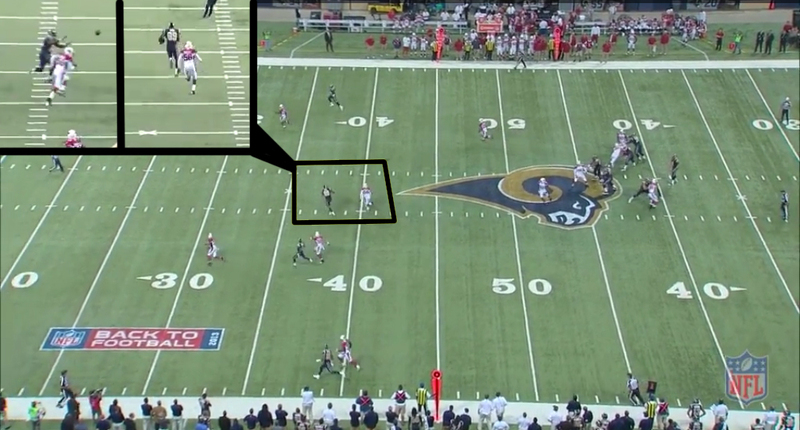 Schottenheimer forced Sam Bradford to consistently drill throws to well-covered receivers in the middle of the field. 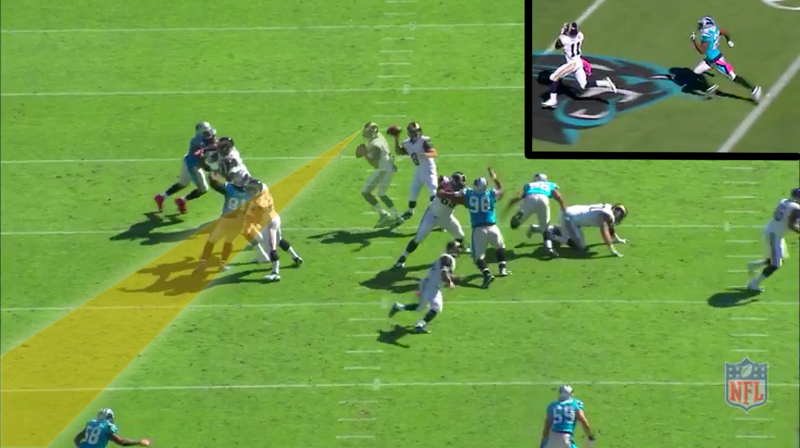 Bradford would make plenty of these throws with proficiency, only to see his pass catcher tackled immediately. Schottenheimer did little to nothing to create space for his receivers to work with, thus failing to help out his quarterback. Sam Bradford’s supporting cast also did not do much to assist him. Chris Givens and Daryl Richardson showed they were not the featured players the team had hoped, while Brian Quick continued to progress at a molasses-like pace. Tavon Austin, when Schottenheimer wasn’t misusing him, spent the early part of his rookie season dropping balls and making mistakes. Newcomer Jared Cook just continued to put out the same inconsistent effort laden performances the Titans had previously grown to expect from him. The Rams offensive line, while better than in prior years, was far from perfect in 2013. Unfortunately, the outside receivers do not shake the man coverage they face, and the inside guys cannot find the soft spot in the linebackers and safeties’ zones. Bradford sits in the pocket patiently, but when no one comes free, the choice is made for him. He is forced to hit the running back in the flat. When Bradford was under center, the Rams’ top three receivers were Austin, Givens, and Quick. Givens is a nice complimentary player, but cannot shake the oppositions’ top corner. Quick is still an unrefined route runner, and Austin is still more of a specialty player. The early season St. Louis offense did not feature a pass catcher who could consistently get open for his quarterback. Some have pointed to the fact that the Rams offense improved when Kellen Clemens took over as a knock against Sam Bradford. While that fact is indisputable, it has more to due with the improvement of the pieces around the quarterback. Zac Stacy’s emergence gave the offense a chance to be truly balanced with a sustaining rushing attack. Brian Schottenheimer wisely began to build the offense around Stacy and it made life easier on the quarterback. 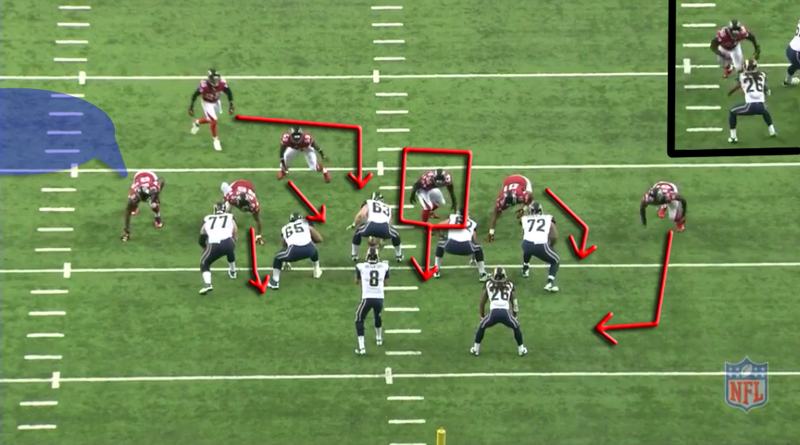 Rodger Saffold’s move to, and surprisingly stellar play at, guard saw the solidification of the offensive line. A draftnik favorite, Stedman Bailey’s quiet emergence also opened up the offense. While the offense did improve with Kellen Clemens, it had little to do with the quarterback swap. If Sam Bradford got a chance to work under those improved circumstances he could have made the offense even better. Bradford has plenty of talent to elevate a team that is properly constructed. 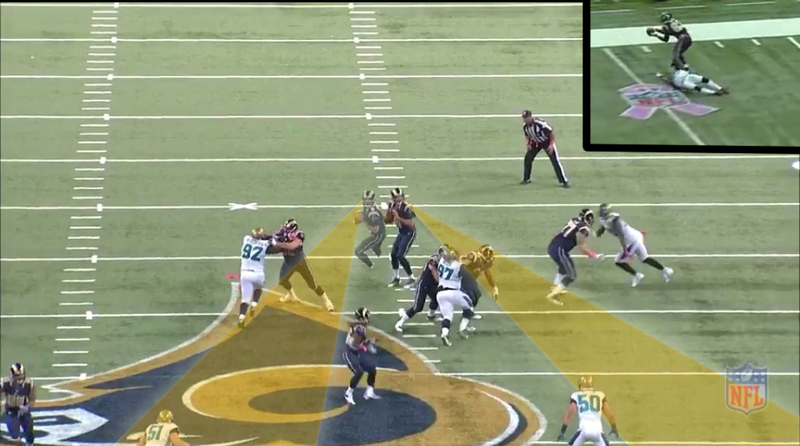 One thing that really stands out with Sam Bradford is how well he sees and reads the field. 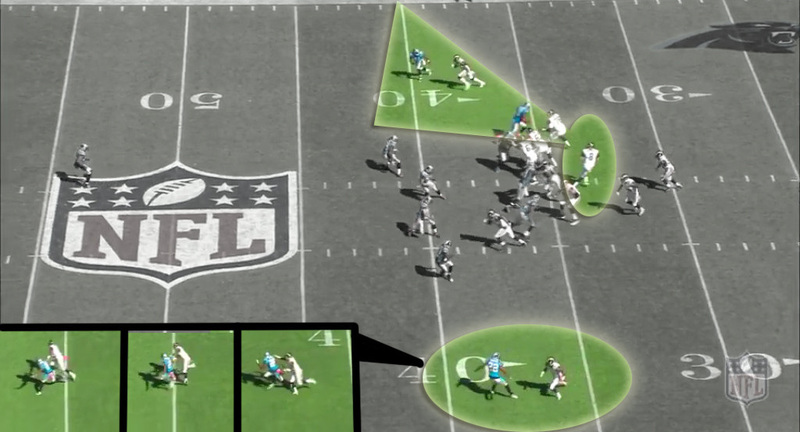 He rarely misfires into coverage based off a poor read, and is adept at throwing deep into his progressions. During his drop and when he first sets his feet, Bradford scans the right part of the field. 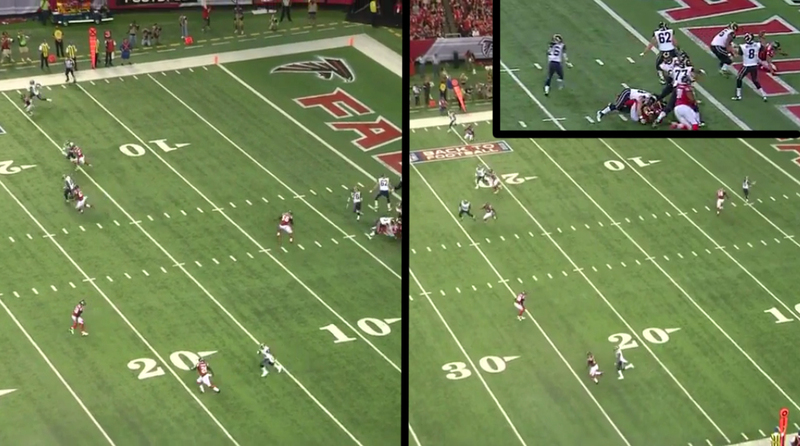 When he finds no one open there, he flips his head around and sees Brian Quick with a little room down the sideline. Bradford flicks the ball with authority into the deep area of the field. The Jaguars’ cornerback slips during his coverage, but even if he had remained in position this likely would have been a completion. Bradford places the pass in the perfect position, outside of his receiver, where only he could make a play on the ball. Some quarterbacks struggle their entire career with coming off their first read, and making great throws deep in their progressions. Bradford has shown he is well past that stage of his development. He is already a great quarterback from the neck up. With the linebacker fast approaching, Bradford quickly looks for the obvious mismatch. 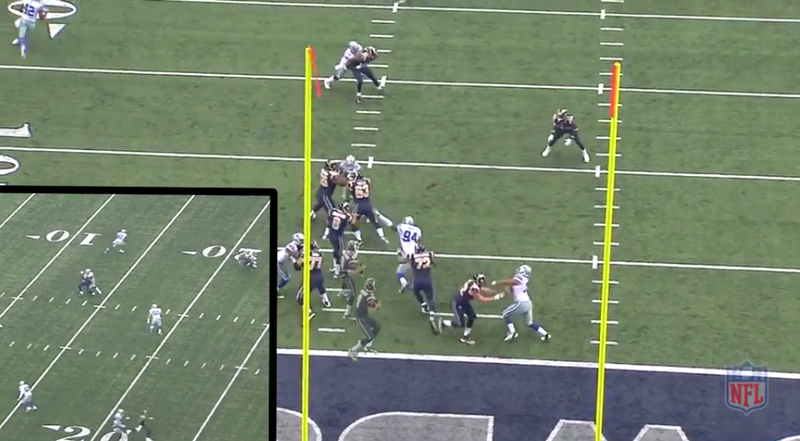 He sees that the defensive end dropping into coverage will be the nearest defender on Tavon Austin’s curl route. Bradford quickly fires the ball to Austin, but the rookie receiver drops the pass. A great response to pressure by the quarterback is wasted by his receiver’s inefficiency. Even though the defenders come at his backside, Bradford still possesses the requisite awareness to feel the rush. He also displays the athleticism to spin out of the pocket and boot to his left. He wisely keeps his eyes downfield and trusts his arm over his legs. It is a good call, as Bradford shows great arm talent to fire the ball down the left sideline, while throwing from an awkward platform. When his offensive line gave him room to step up, Bradford showed he is very good at climbing the pocket. Here, he keeps his eyes downfield as he navigates the pocket away from the edge pressure. 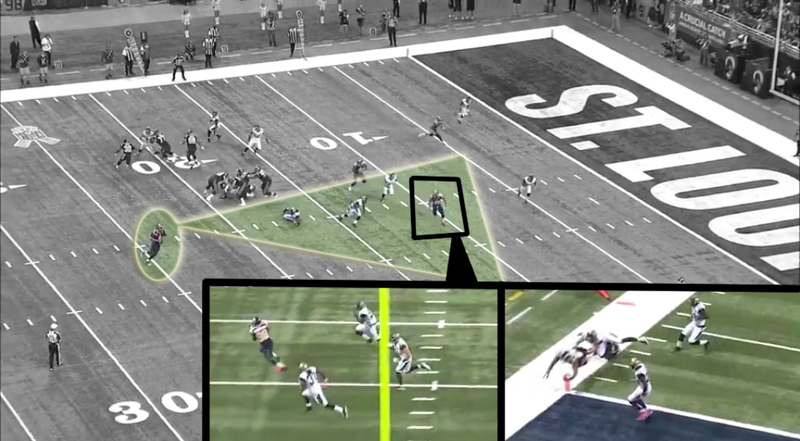 Unfortunately this leads to nothing, as his receivers again fail to get open. Bradford is forced to dump the ball off to a running back before he risks holding the ball too long. The book on Sam Bradford when he was selected at the top of the 2010 NFL draft was that he was a very accurate passer. It still reads true today. Sam Bradford is really good on bootlegs, though Brian Schottenheimer hardly ever gives him chances to show it. On one of the few play calls of this variety, Bradford’s great ball placement, and arm talent, on the move leads to a score. 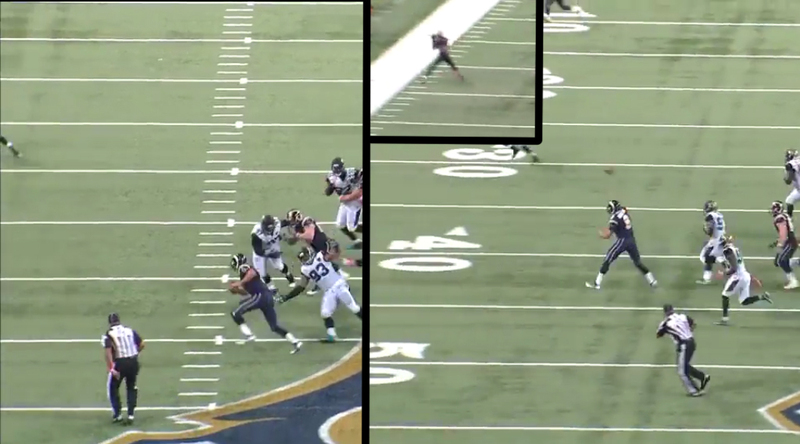 Bradford runs parallel to his tight end, and throws the ball to Kendricks as he breaks free. While this may look like an easy throw, Bradford puts the icing on the cake by placing the ball in the perfect position to allow for yards after the catch. Kendricks doesn’t score this touchdown without the perfect ball placement from Bradford. The fact thsat the fourth year passer does all this while on the move makes it even more impressive. Cook streaks over Karlos Dansby, but doesn’t come wide open. The linebacker is still between the quarterback and the pass catcher. However, Sam Bradford shows he can make the perfect throw. With great zip on the ball, Bradford threads the needle and gets the pass in to Cook. Since his quarterback puts the ball in the perfect spot for his receiver, Cook is able to turn downfield and race to the end zone. The great throw would have ended with a score, had the tight end not fumbled at the goal line. Since the team somehow still employs him, Brian Schottenheimer can continue to build the offense around short passes. However, he would be wise to design more plays that let his quarterback show off his strengths. Incorporating more slant and post routes would allow the offense to surge under Bradford’s stellar accuracy and ball placement. 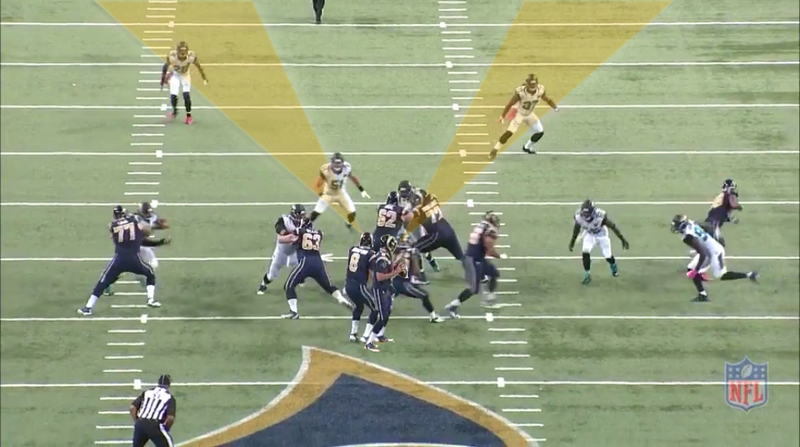 After watching the Rams offense on the all-22 film, it is almost impossible to conclude that Sam Bradford is the root of the teams’ issues. He displayed a number of positive attributes and growth all while being placed in a dysfunctional offense. Bradford’s percentage of good throws during his injury shortened 2013 season show that he is better than both his basic statistics, and the national perception of him. When the month of May rolls around, the St. Louis Rams will have a rare opportunity to take a blue-chip quarterback prospect. As an average team, they should not be picking this high in the draft. Despite all that, they should pass on the chance. The Rams already have a quarterback who has proven capable of leading their team.